THE LAST time that Super Eagles coach Stephen Keshi was the focal point of my World Cup dairies, Nigeria had just played a goalless draw in her opening match of the tournament with Iran and soccer fans in Brazil at home and in diaspora were expressing their disappointment at a listless Eagles performance. I then went on to admonish Keshi in the following words: “Irrespective of the outcome against Bosnia (in our second game), Nigerians want to see a Super Eagles playing with spirit and aggression, creativity and quick movements, accurate passing and overlapping runs, as well as accurate shooting and goal scoring. 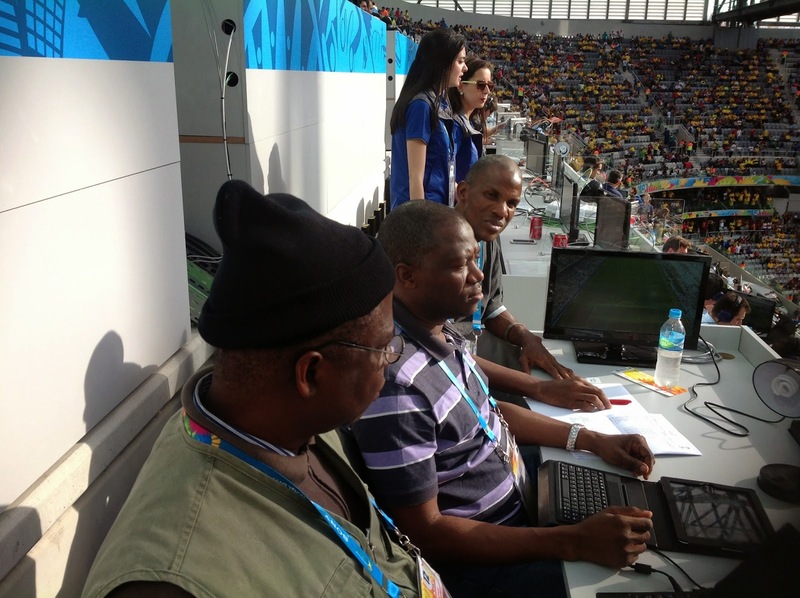 “Keshi must swim…..or sink!,” I concluded. What a remarkable turn-around just one week can make in the fortune of a coach. After the Iran game, the Eagles indeed went on to post a winning performance against Bosnia Herzergovina, recording a 1-0 victory through a goal by Osaze Odemwingie. And although they subsequently lost their final group game 3-2 to Argentina last Wednesday, their four points on the Group F table have been enough to qualify them for the second round of the World Cup where they will meet France on Monday. I had challenged Keshi to swim or sink. Well, the BIg Boss has swam into history and Nigerian football folklore. Anytime the story of Nigerian football is talked about, Stephen Keshi will command a chapter on his own if not more. Before Keshi was appointed as Eagles coach just over two years ago, Nigeria had not won the African Cup of Nations for 18years (since Tunisia ’94); had not won a game at the World Cup finals for 16 years (since France ’98) and had not qualified for the second round of the tournament for another 16 years (also since France ’98). Last Wednesday at the Estadio Beira-Rio in Porto Alegre, Brazil, Keshi completed the scrapping of all three unwanted records by qualifying the Super Eagles for the second round at Brazil 2014. Following his triumph at the 2013 Africa Cup of Nations and the 1-0 win over Bosnia -Herzegovina at this World Cup, Keshi has now equalled Nigeria’s best records at both the Nations Cup and the World Cup. If his team comes out victorious against Group C winners France in Brasilia on Monday and reach the quarter-final stage of the World Cup, Keshi will stand alone as Nigeria’s most successful coach ever. Not bad at all for a home boy. Departmental analysis of Eagles performance versus Argentina. Vincent Enyeama resumed his personal confrontation with four-time world player of the year Lionel Messi and the little Argentine came out victorious this time. Four years ago in South Africa 2010, Enyeama stopped everything Messi had to offer and Nigeria only lost to a goal by Gabriel Heinze. This time, Messi destroyed Enyeama's "Clean-sheetometer" with two goals, the second a brilliant free kick that left the Nigerian goalkeeper stranded. Overall, however, it was another impressive performance by the Lille shot-stopper, without whose intervention the goal count against Nigeria could have been more. Captain Joseph Yobo declared post-match that the Eagles passed their test against Argentina and I agree. After going down 1-0 very early, Ahmed Musa's quick equalizer allowed the Eagles to maintain their defensive shape for most of the first half until Messi's free kick goal late in the half. Even in the second half when Keshi instructed his boys to attack more, the defence line was able to cope with the added pressure from Argentina. Once again, Kenneth Omeruo was the stand-out performer, but Yobo, Ambrose Efe and Juwon Oshaniwa (the boy has progressed in leaps and bounds) all performed brilliantly. The rest of the team also provided defensive cover as even the strikers tracked back consistently while the midfield did its job of breaking things up. It was an overall good defensive performance by the Eagles against some of the best strikers in the world: Messi, Sergio Aguero, Angel di Maria and Gonzalo Higuain. As indicated above, the Eagles midfield held out although Mikel Obi was still rather disappointing. For such a high caliber player, Nigeria expect a lot more than Mikel has delivered so far in this World Cup. His famed shielding of the ball did not serve him well as the Argentines continuously robbed him of the ball to launch quick counter-attacks. A few occasions nearly resulted into goals as Mikel would only then jog slowly rather than chase hard to win the ball back. By contrast, Ogenyi Onazi posted an improved performance over his two previous showing. His tackles were timely and he was all over pitch. Michael Babatunde was again selected ahead of Victor Moses in offensive midfield and the boy showed his talent again. Unfortunately, he suffered a serious injury and Nigeria will certainly miss his skill and aggression against France. It was Keshi and two-goal scorer Ahmed Musa that attended the post-match conference for Nigeria while Coach Sabella and Messi attended for Argentina. When it was question time, I was the first to take the microphone among the media corps from around the world. I congratulated Keshi on his historic achievements for Nigeria and asked him to share his thoughts on the game. 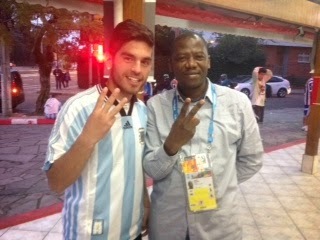 I then directed the following statement to Musa: "Congratulations on your two fantastic goals for Nigeria today. I am one of your critics because we've not been satisfied with your previous performances. What have you got to say to us your critics now that you had such an excellent performance?" 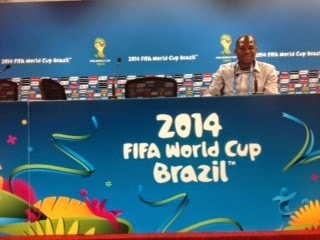 Yours truly in the media conference room where I put questions to Stephen Keshi and Ahmed Musa. Luckily for me, Musa is not a talkative, otherwise he could have given me a serious tongue-lashing. But the CSKA Moscow player only said: "I won't say much. I always knew what I am capable of doing and I thank the coach for having faith in me. I'm just happy that I scored two goals and we have qualified for the second round even though we lost the game (to Argentina)." Musa was Nigeria's goals hero, but Emmanuel Emenike and Osaze Odemwingie were no less impactful. Although the Eagles spent most of the first half on the defensive, the strikers created all sorts of problems for the Argentines each time they foraged upfront. And when the game opened up in the second half, the threat from the Nigerian strikers was real. Coming into the World Cup, goal-scoring had been one of Keshi's weak points as his team struggled to score even though they did not concede too many goals either. Hopefully, the two strikes against Argentina would boost their confidence in going for goals against France. We are now in the knock-out stage of the World Cup and goals will be decisive.I end this again by saying, good luck to Nigeria. I share your cautious optimism.